1. Blend the frozen cherries, strawberries, raspberries, NeoLifeShake, TRÉ and water until smooth. 2. Transfer the smoothie to a bowl. For the best result, gently place your smoothie bowl in the freezer for about 5 to 10 minutes. This prevents the toppings from sinking into the smoothie. 3. 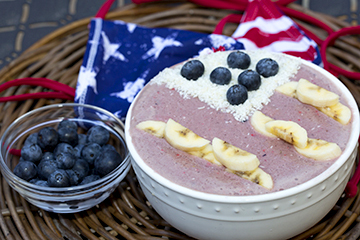 Decorate the ‘flag’ by sprinkling some shredded coconut in the top left-hand corner. Arrange the sliced banana into ‘stripes’ and sprinkle blueberries over the coconut to make ‘stars’.